KATE ROSS – People Make The World Go Round. LIMITED EDITION VINYL ALBUMS OF “PEOPLE MAKE THE WORLD GO ROUND,” ARE ONLY AVAILABLE THROUGH MY WEBSITE. GET IN TOUCH and PLACE YOUR ORDERS NOW! LIMITED EDITION NUMBERS RANGE FROM 1 TO 150. THEY ARE GOING FAST AND AVAILABLE FOR PURCHASE THROUGH PAYPAL. EMAIL info@KateRossMusic.com TO RESERVE AND CONFIRM YOUR LIMITED EDITION ALBUM NUMBER NOW! 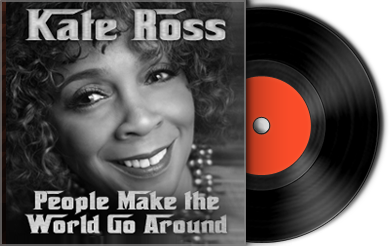 Enjoy streaming audio music samples from Kate Ross’s new album “People Make The World Go Round.” BUY HER CD, ALBUM or individual MP3 TRACK DOWNLOADS here. Single motherhood, chronic pain and illness would be enough in many lives to saddle oneself to a life of dreams unfulfilled, but not so with a vocalistKate Ross, from the midwestern city of Columbus, Ohio. With her new CD and album release, in the latest stage of her journey, Ross, as an artist is teeming with optimism and opportunity. Her new CD/album title, “People Make the World Go Round”, is an appropriate, when you take into consideration, Ross’ journey and the people who have encouraged and illumined the way on this portion of the Columbus jazz vocalist’s path. Ross reflected, “This song has been our signature song since we assembled the band fifteen years ago. My guitarist, Craig McMullen was the one that really put his stamp on the arrangement and changed it to suit me. People really do make the world go round. No matter what you do, you have to deal with whatever is going on in your life and keep moving.” The menu of selections on the disk is an eclectic mix of songs designed to appeal to a myriad of listening tastes. Ross’s closest musical colleague, McMullen is the legendary guitarist who played and toured the world with singer, songwriter and civil rights activist Curtis Mayfield during the seventies. He is regarded in guitar circles as one of the finest of the genre. Ross met McMullen during the late eighties upon her return to the Buckeye State after having moved from Atlanta, GA. He is the longest tenured musician with Ross’s band. She sang with a band titled, “After Hours”, before forming her current band, which includes Craig McMullen, keyboardist Caleb Hutslar, bassist David Irwin (now deceased) and drummer Roger Myers. Ross has also performed with artists such as bassist Brad Mellon, bassist Jeff Bass, keyboardist Jon Eshelman, keyboardist Lucas Holmes, and drummer ‘The Governor’. The song list begins with “Kate’s Song”, co-written by Ross and Art Bell. This song is basically the story of my life. A person who has dealt with a lot of different things and balancing what I wanted with what I needed to do. Keyboardist Hank Marr, was the inspiration for the cover of the only jazz standard on this recording “Without A Song.” I performed this song at a Mother’s Day brunch with Marr a few years before he passed,” Ross explained. He gave me a lot of his music books and I really got to know him well. He was a beautiful person. Many of the compositions on this project are written by Art Bell. Bell was an artist Ross met on the internet through a website called Musicians Friend. Art was looking for someone to perform his music. Bell’s “Meet Me” is a song about a woman who like many is on that eternal quest of looking for that special love partner. “Home To Me” is a beautiful song that reminds Ross of her children: children who will grow up to sprout their wings and eventually leave the nest. Not something you want but it’s a happenstance that all parents eventually have to endure. “Up Into the Big Blue Sound” written by Ross’s bassist Dave Irwin is a remembrance and lament of lost art and cultural institutions that have fallen by the wayside through the passage of time. Ross explains, “It’s so important to find that place somewhere where you can go. When I was sixteen years old there used to be a club on Mt. Vernon Avenue called, “The I.V.L. Club”. It was a private club that I used to sneak in on Sunday’s and they played nothing but jazz. It was important for me to have a place like that where I could hear Ella, Bird and that generation of jazz performers that are no longer around. “Midwinter Dream” is another Art Bell penned composition that is done in the spirit of calmness. The kind of song you want to sit and cozy by the fireplace or hear the idyllic sounds of people caroling outside your door. Kate Ross’ journey in life or on the bandstand is authentic, filled with joy, pain and ultimate triumph! It is soulful. It is a snapshot of her story to this date. As you listen to the assemblage of song, may you get caught up in her soulfulness as she reminds us that “People Make The World Go Round“.